There is extra excitement planned for PCA&D Alumni returning to the College for the Class of 2016's Senior Show and Celebration tomorrow night. Alumni are asked to check in at the Alumni table, staffed with a team of fellow alumni led by Joe Palumbo '08 There you can meet other alumni and sign up for the new PCA&D alumni network, an excellent first step in starting your own creative network. At the table, you can pick up your "Proud Alumni" pin designed by Kyle Newkirk '15. We encourage alumni to wear the pin around the Senior Show. You never know whom you’ll connect with while on your visit. 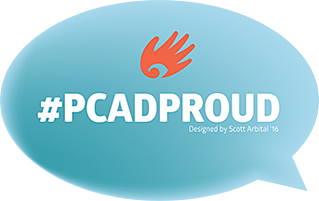 While you are here for Senior Show, please take a selfie or two with members of the Class of 2016 and post then on social media with the tag #PCADProud! (Remember to like the Alumni of PCA&D page on Facebook to post your pictures and follow news about PCA&D and your fellow alumni throughout the year). Look for the "thought bubbles," designed by Scott Artital to make your selfies more fun. There's one for each major! I n addition, any alumni who signs up will be entered in a raffle to win one of a few donated prizes, including a CREATE necklace from Mio and a "truck" of cleaning supplies from Certified Carpet. According to Palumbo, "One of my favorite events of the year, thePCA&D Senior Showis a great opportunity to reconnect with classmates, fellow alumni, staff, and meet the next generation of artists. Many times I have bought t-shirts, prints and exchanged business cards with the seniors." Thanks for helping welcome the next class of great artists from PCA&D!